In most of the posts on this site the natural beauty and wonder of the summit are presented and discussed. I guess on some higher plain, that natural beauty belongs to all of us, but in modern human culture, especially in the US, people like to own things. The land on the summit is no exception and the thorny issue of land ownership on the summit can effect how you enjoy the area. There is a long history of settlement of the summit area and through that history many people and organizations have bought up areas of the summit. Today the area is a hodge podge of tracts owned by private individuals, corporations, and the United States and state of California (aka the “public”). The maps presented below illustrate just how carved up land ownership of the summit is. 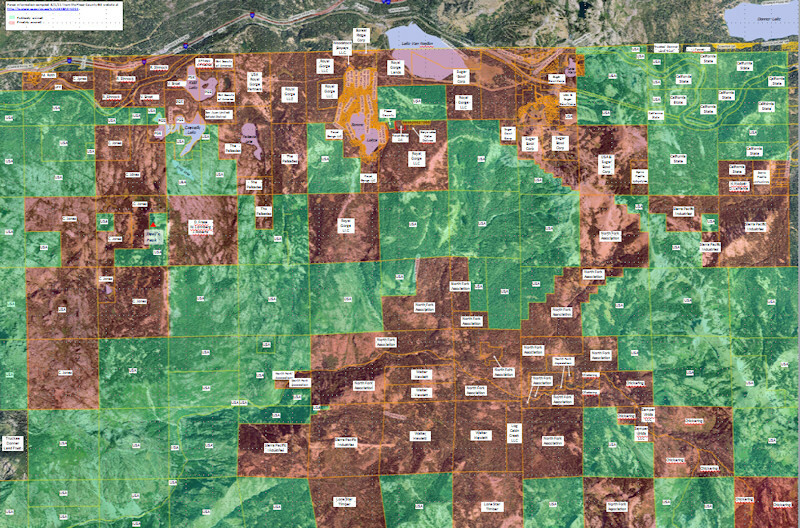 These maps were generated from the online public Geographical Information System of Placer County, which covers roughly the southern half of the summit area. Unfortunately, Nevada County, which covers the northern half, does not make this information accessible online. Parcel Map of southen Donner Summit area. Click on the map to access a larger PDF file of the map. If you study the map (this is probably easier if you download the PDF file of the map) you will see that many of the places that are described on this site are at least partially on privately owned tracts. In many cases this is not really problematic, because the owners have a benign laissez faire policy that is tolerant to people passing over their land. This may vary between winter and summer months. For instance, Van Norden Meadow is owned by Royal Gorge and Sugar Bowl and during the summer months the beautiful meadow area is accessible. However, during the winter, Royal Gorge has ski trails through the meadow that require a trail pass from Royal Gorge to ski on. On the other hand, many areas have been posted (the signs are not always prominently displayed) and the owners do make an effort to discourage the public from passing through their land. Most of these owners are seriously concerned with preserving the pristine nature of their lands. In many cases access roads are gated and barriers such as boulder lines are erected to keep vehicles out. This is the case with the Cedars area, the Palisades and some tracts around Kidd Lake. While most areas are tolerant of hikers, some of the areas prohibit any trespassing on the land. Public access to many of the areas of the summit is made possible by public roads maintained by the county. Kidd Lakes Road and Soda Springs Road are two main arteries through the summit back country. So what’s an outdoor enthusiast to do? I’m afraid I may be getting a little preachy here, but as a lover and more importantly a user of the summit area, I will be injecting some of my thoughts here. First of all I think it is a given that no matter what land you are utilizing, public or private, every effort should be made to make a minimum impact on the land. It goes without saying that whatever you bring in should be brought out. Hiking and skiing are activities with very low impact on the environment. Mountain biking also has very little effect with the exception of large bike races. Organized races are are usually held at venues such as Donner Ski Ranch and do not significantly effect the back country. In the case of some trails such as The Hole in the Ground, the trail is maintained by mountain biking organizations. The real concern by most land owners and environmentalists is the use of the land by motorized off highway vehicles (OHVs). Many visitors to the summit come up in their 4WD trucks and SUVs and will often be tempted to put them through their paces on the many logging roads in the area. These powerful two ton vehicles can have pretty devastating effects on these old roads, especially in the wet spring. It is for this reason that many owners erect barriers on access roads. As an owner of one of these 4WD vehicles, I think 4 wheeling should really be restricted to the public access roads such as Kidd Lakes Rd and Soda Springs Rd which are maintained by the county. In the last ten years there has been explosion of smaller OHVs including dirt bikes, ATVs and SideXSides. These vehicles have made it easier for many more people to enjoy off-road riding. Unlike the larger 4WD vehicles, these vehicles can penetrate the back country trails in addition to the old logging roads. As a result there is the potential for a much wider impact of these vehicles on the more fragile back country trails. As a trail riding lover that actively rides a Honda trail bike (and Linda rides an ATV), I can understand the lure of riding the back country. There are however ample opportunities to ride on the public access roads as well as many logging roads on the south side of the American River gorge (down Soda Springs Rd) . 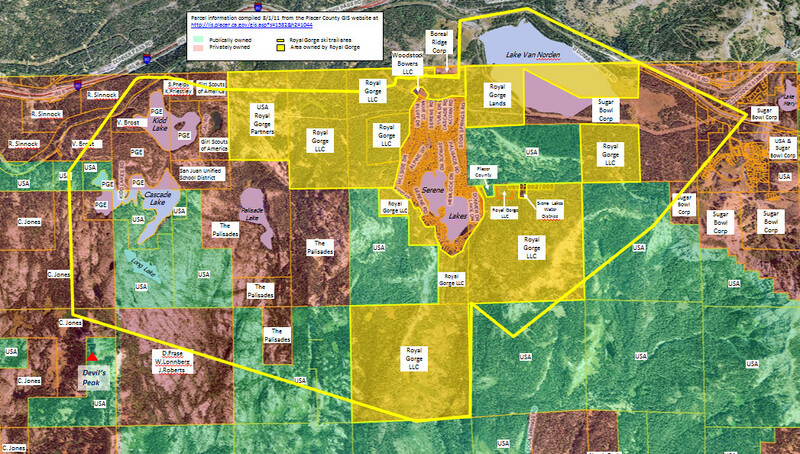 My feeling is that the use of OHVs in the Royal Gorge ski area (from Long Lake to Van Norden Meadow) and the areas north of Hwy 80 (Hole in the Ground and Castle Valley areas) would be too destructive to those areas and should be prohibited. I guess the answer to the question of “who owns the summit” is really that we all own pieces of it. Having covered at least 80% of the area, I can attest to the fact that most of the area is accessible. As is true with any neighborhood, enjoying it’s benefits requires that you respect your neighbors and the environment, and responsibly use the resources that are available. It is the goal of this post to provide information that will help the visitors to this area have an enjoyable and trouble free visit to the area. Lately Royal Gorge Ski Resort has been in the news due to the notice of default it received on a 16.7 million dollar loan. 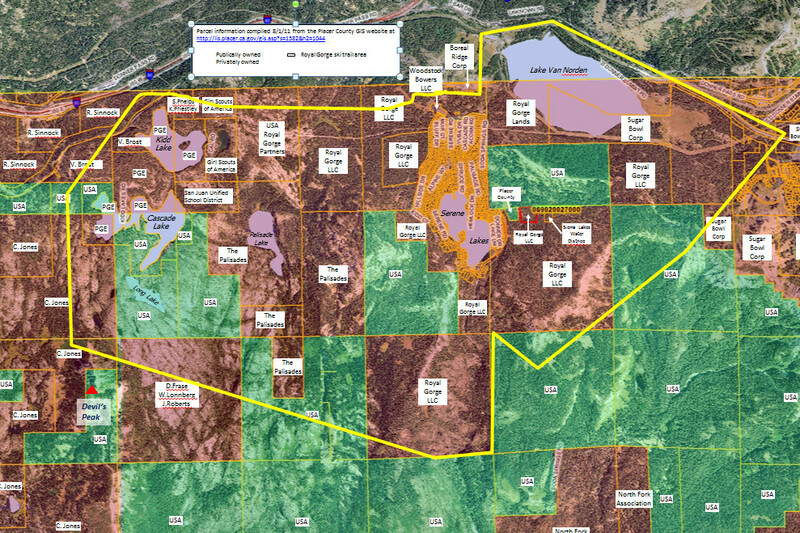 Royal Gorge LLC is a major land owner in the summit area and there is concern as to the fate of this land. The map below shows the area of the summit that the Royal Gorge ski trail system covers and the land they own. It is interesting to note that while Royal Gorge owns a large portion of the land the ski system extends through, much of the land that is utilized by the system is actually not owned by Royal Gorge. Much of it is privately owned and Royal Gorge has agreements in place with the other land owners. Some of the land is actually US Forest Service land although some of it is only accessible through private land. There is no doubt that a change in ownership of Royal Gorge lands would have a significant effect on the summit area. There are many possible scenarios of the fate of these lands that are currently floating around (see this Moonshine Ink article). Certainly the loss of the cross-country ski resort would be a blow for ski enthusiasts as well as to the local economy. One can only hope that whatever happens, the ski resort can survive and in the best case even improve in its service and facilities. A scenario that involves the preservation of the land by a conservancy organization such as the Truckee-Tahoe Land Trust could be the best outcome for the outdoor enthusiasts that follow this site. Organizations such as the land trust have been very successful in preserving wild spaces while still making them accessible in a responsible way to everyone (see Independence Lake post) The next year could bring a lot of changes that could effect ownership on the summit. One Response to Who owns the summit?